You remember the popular book, The Purpose Driven Life by Rick Warren? It became wildly popular over a matter of days as one by one people across the globe began reaching for the book in hopes of learning what their life purpose was. And even today the book still remains one of the most referenced on the Christian bookshelf. 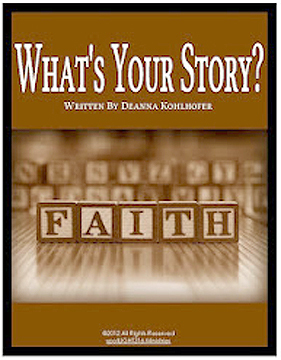 Well, Deanna Kohlhofer has taken the concept of our God-given purpose to the next level in her eight day devotional e-book, What’s Your Story? In her short devotional book she takes her readers from understanding his/her God-given purpose to writing their God-given story down for others. This short but thought provoking set struck a close cord to home as my father is currently doing just that – writing his God-given story down for his children and grandchildren. Needless to say I will be sharing this e-book with him soon as I think it will help him as he thinks about his life from a slightly different angle … a heavenly angle. Be prepared to have a journal and Bible in hand as you read this book for it is not your average quick read e-book. Deanna will have you looking up scripture, taking notes and taking time for personal reflection each day. While the devotions themselves are rather short (little more than one page long), the heart analysis involved will take much more time to process. If you have never thought about writing down your God story before or have thought no one might be interested in reading it, think again. As Deanna explains, God places people on your path who need to hear your story. Now they may not sit down and read it all from front to back but by taking time to analyze your life and write your story, even if just for yourself, you will have a resource from which you can draw a conversation that may impact another person’s life for eternity. Although I’ve seen a few books intended to guide the reader to write an autobiography, I have never seen a book geared towards guiding the reader to write their life story quite like Deanna does in her book, What’s Your Story? She steers her readers through the process verse by verse and question by question to writing their story with the similar Keepin’ It Real personality found on her blog spotLIGHT316 (http://journeywithd.com/). As a bonus she also provides a sample of her life story, which is quite an amazing read to say the least. Totaling 24 pages, this book is a great lift-off for writing your own life story. Deanna gets her readers thinking, prepares them for action and guides them through the process in a non-pressuring manner. While you probably won’t be finished with your God-story after the eight days, you will have a stronger direction on where you want to go and what you want to cover as you venture forward. And, she also helps you to look at life as it comes from a slightly different angle too, which is also a blessing. With that said, now, what’s your story? Gossen writes at Cornerstone Confessions (www.cornerstoneconfessions.com), a blog about the “disclosures of a developing domestic diva drawing on the divine.” She makes no claim to be a professional organizer, house cleaner, cook or any other form of professional domestic. She is just your average, stay-at-home mom whose goal in life is to strive to be that Titus 2 woman. The blog “just happens to provide me a way to share with others things I learn along the way about loving my husband, teaching my children, being busy at home and so on.” Her blog post is at http://www.cornerstoneconfessions.com/2012/06/what-your-story.html. THOUGHT TO REMEMBER: Too often we don’t realize how great we have it until something is taken away. This entry was posted in Readin', Ritin' & Rithmetic and tagged Blog Business, Books, DPchallenge, faith, family, Giveaways., review, Thankfulness. Bookmark the permalink. 16 Responses to What’s Your Story? จริงๆ ดี บทความ ในการสร้าง ขึ้น ใหม่ เว็บไซต์ . simulation game for your first mobile games is that they can be confusing with some hay day hack pleasant game handling functionalities. Hi, yeah this article is genuinely fastidious and I have learned lot of things from it about blogging.